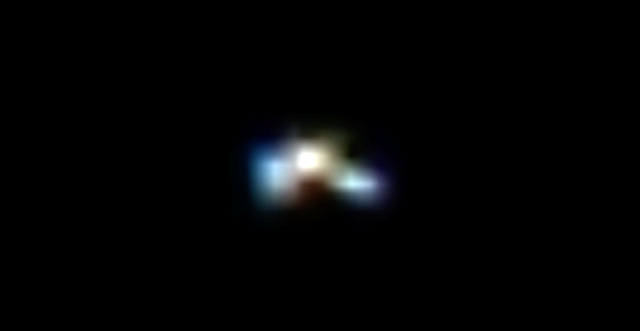 UFO SIGHTINGS DAILY: Astronomer Catches UFO or TR3B As It Passes Earths Moon, Nov 14, 2015, Video, UFO Sighting News. Astronomer Catches UFO or TR3B As It Passes Earths Moon, Nov 14, 2015, Video, UFO Sighting News. I've seen jets pass in front of the moon numerous times. Every time you can make out the wings and tail. This object is not a jet. Its much higher and its leaving the atmosphere to enter orbit or beyond. Its not the space station, because the ISS doesn't' have rockets like that. It could be a top secret the military doesn't want us to know about. It has a raised glowing center like a classic disk, which is confusing, and has a triangle shape like TR3B. Its colors are blue like the Aurora project...a secret project made with alien tech (it crashed in Needles, CA a few years back). I would say this one is USAF from Area S4. Using my telescope to view the moon. (type of scope everything is upside down and backwards). Object enters field of view on telescope. Scope is 400 mm focal length with 3.6 mm lens = 111x magnification. Object moved very quickly less than 1 second out of scope view. Could be a satellite? but it left a trail that lasted very shortly black to white to nothing. Checked my astronomy software, no comets or asteroids in vicinity. Last satellite to pass would have been 9 to 10 minutes prior to observation. Had my telescope hooked to my cell phone which caught the video. Phone dates the video November 14th, 6:38 pm. I have extracted the small section of the video, but still retain the original if needed for further purposes. Would just like to know what I captured on video.